The technique of filament mosaic makes use of vitreous enamels and exploits their characteristic of liquefying at high temperatures.The enamels can therefore be mixed and molded to cretate rods of different colors and forms.This technique makes mosaic resemble painting as the enamels are mixed as if they were oil or tempera colors until the desired shade is obtained.The difficulty of this technique is due to high temperatures needed for this process. THE PROCEDURE FOLLOWS THE SUBSEQUENT WORK METHOD: 1)The enamels are placed on a crucible towards which a powerful flame is generated by gas and air is directed. 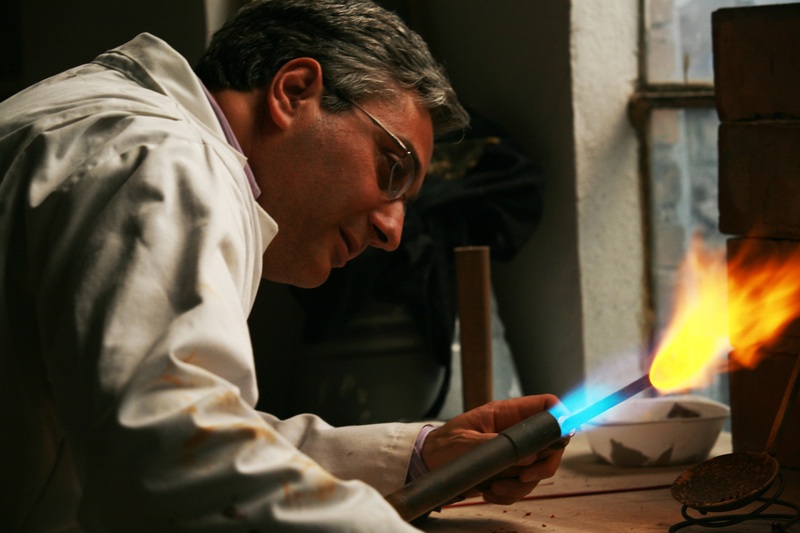 2)In the high temperature (about 900 C°) the incandescent enamel material becomes viscous and sticky.At that moment it is ready to be detached from the crucible with the help of a metal rod 3)The heated enamel material is mixed and made compact with the help of the metal rod.By mixing, the air bubbles trapped inside are eliminated 4)Then with the help of two small marble slabs the incandescent material is molded to the desired form, in this case a rectangle 5)The enamel material is then pulled with tweezers, to obtain a thin rod,Once cooled,it will become rigid again.The more you pull, the smaller the rod becomes.It is interesting to note that the form given initially to the enamel material is maintained with the same proportions. In the case of the filament technique,the tesserae are not cut and therefore made with the mosaic hammer and the hardie but from the rods obtained from the spinning procedure.The rods are incised with a sharp file and chipped with tweezers.During the melting procedure one can combine two or more colors together in order to form composite hues .This procedure is generally used to simplify the execution of certain features of the composition such as the human figure , the foliage,architectural or anatomical details.The filament technique enables the production of micromosaics.In fact the more one lenghtens the melted enamel material, the smaller the rod’s section becomes.This method allows the realization of microscopic tesserae and consequently the production of incredibly minute mosaics. A layer of stucco ,produced according to an old and secret recipe handed down from a generation to another,is applied and glued onto a metal support tray outlining the same dimensions of the subject one wishes to portray. A copy of the image to be reproduced is pasted onto the stucco. Using a cutter the image is incised. Once the section of the photo is removed, the tesserae are applied in the stucco portion where the design was impressed.The mosaic is made slowly from the top to the bottom, from left to right as in the writing process. Discussion on this post is closed.